Brighten your smile with safe, effective and convenient tooth whitening system custom made for you!! 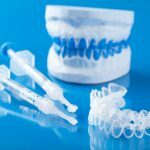 The Opalescence system is created by your Dentist and includes custom trays to fit your teeth. Once completed this allows you to receive professional whitening in the comfort of your home and at your convenience. Working from the inside out, the active ingredients in Opalescence gels penetrate your teeth to break down the discolored molecules deep down in your teeth, removing stains and whitening your smile. Our original, patented formula contains PF (potassium nitrate and fluoride) and is sticky and viscous, so it stays where it’s placed. This unique feature prevents the gel from migrating during treatment and helping keep the gel and custom tray in place so it can continue whitening your teeth for the duration of the treatment. Teeth whitening results are very stable; leaving you with a stunning smile long after treatment is over. 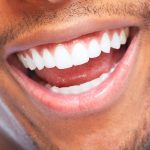 However, there are a few factors that can make teeth lose their luster. Things like genetics, diet, age, some medications (like tetracycline), and certain habits (like smoking) may affect the length of your whitening results. Fortunately, touch-up treatments are quick and easy, helping you get that bright, white smile back. Interested? Discuss your options with your hygienist today! !